I get question about this method a lot, ever since I accidentally discover this usage for Oxi Clean, so I might as well post it here. It's non-toxic to the touch and no toxic fumes compare to alcohol, paint thinner, etc. (Environmentally friendly). Works extremely fast and can dissolves or strip Tamiya paint completely. You can soak plastic and resin without damaging the parts. Unlike soaking in alcohol or thinner, you don't get this gunky mess on the bottom of your container. You can even rub paint off with your bare hands bathing in Oxi Clean. Dissolving paint will not gunk up and stick to your hand. The amount of solution you can make from one tub of Oxi Clean, it's cheaper then buying the same amount of solution of alcohol, thinner, etc. It's a freaking laundry detergent to begin with, you can clean your clothes with Oxi Clean if you get paint on it. Also, recycle use of those Tamiya paint bottles easily with it. What can Oxi Clean Strip? Tamiya acrylics and similar types of paint can be strip extremely fast and easy using Oxi Clean. This method also works for models coated with Future Floor Wax as a clear coat. Oxi Clean also strips paints such as Folk Art, Delta Ceramcoat, Apple Barrel, etc., but not as efficiently as Tamiya. As a warning, if you use enamel as a primer and is stripping acrylic paint off, keep soaking time to a limit and always rinse with water afterwards to stop oxidation. Short soaking time about under 30 minutes will not damage enamel. However, long term soaking about 30 minutes or more can cause enamel to bubble up like goose bumps and patchy peeling. The enamel do not completely come off causing a disgusting looking mess. If you did not get all the acrylic paint completely off the first soak, allow 24 hours before the second attempt because Oxi Clean can weaken enamel a bit. This chemical reaction causes the enamel to absorb moisture. You must allow the enamel to completely dry and re-hardens. A second soak immediately after the first soak will only continues to add more moisture into the enamel and then to the point where it will damage. Automotive Red Glazing Putty can also survive soaking in Oxi Clean but only up to a certain time limit as like enamel paint. This varies depending how large and thick the area of the putty is and how long it had cured. Cured and harden glazing putty may survive being stripped off if soaking time is kept under 30 minutes or less but keeping under 15 minutes is recommended. Remember to rinse model off afterwards to stop oxidation. Tip: If your model is completely painted with Tamiya and then detailed with enamel (such as painting of panel lines, figure eyes, etc., Oxi Clean will dissolve the Tamiya paint causing the enamel detailing to lose it's bond and peel off cleany. If you coat enamel completely over the model such as a enamel clear coat, the Oxi solution will not be able to attack the Tamiya paint and will not work. You can clean paint off your tools but use caution. Caution is needed to soak metal tools in Oxi Clean because oxidation can cause metal to discolor or rust. Chrome is safe but I would suggest to keep soaking time under 15 minutes. I had cleaned my tweezer and parts of my airbrush by soaking in the solution for less then 5 minutes then rinse with water. You can also clean brushes but also with caution. Do not soak the handle of the brush in the solution. Some paint brushes are made of wood with a painted handle. 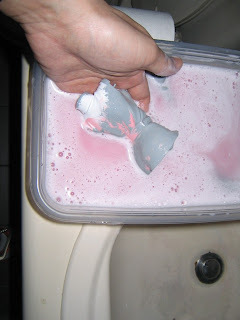 Soaking the handle can cause damage to finish of the painted handle. In some case can even cause the wood to warp. This had happen to one of my brushes. Length of time of soaking before damage is not known. Remember to always rinse tools off with water afterwards to stop oxidation. You will need to mix hot tap water with Oxi Clean. Hot water is important to get the best usage from the Oxi Clean solution. When I say hot, use the hottest tap water you can get from your faucet,not boiling hot water from the stove. You want to strip paint not make soup out of your model. 1 generous teaspoon scoop of Oxi Clean should be enough to make 2 quart of solution. You can choice to add more Oxi Clean if you feel the solution is not enough. However, from experience, 1 teaspoon to 2 quart of hot tap water can do the job. I suggest you start with that and only add more Oxi Clean if you feel you need more strength to the solution. No point wasting Oxi Clean if you don't have to. Below is a demonstration and some instructions to help understand how to use it and get the best result possible. Here is a resin model that was painted with Tamiya acrylics that had cured for 6 months. Under the paint job is enamel primer. I placed the model in a 2 quart Glad container. Next, I had already filled the container with hot tap water first and then 1 teaspoon of Oxi Clean. In under 5 minutes of soaking, the solution already dissolved a huge portion of the Tamiya paint. Time does vary depending on how old the paint job had cured. As you can see on the next photo, I am rubbing the paint off with my bare hands in the solution. I had also used a tooth brush to scrub out someTamiya paint in tight places and any paint left that did not completely dissolved. 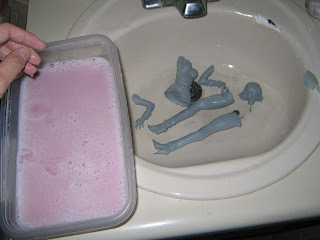 Don't get discourage if some patches of Tamiya is not dissolved or come off during soaking or scrubbing in the solution. Rinse model under warm/hot running water and more paint may come off! Here I had already placed the model under running warm/hot faucet water and more paint continued to dissolve off. As you can see, the Tamiya paint is fully removed from my model leaving only the enamel primer. The enamel has not been damage since soaking time was short. I had pour out the solution after the stripping is complete and then rinse with water. Notice there is not paint gunk in the contain and sink? Labels: *BPMS Member's Tutorial, Gordon C.